President Obama’s decision to unleash the Environmental Protection Agency on US carbon dioxide emitters is a sea change in environmental policy and is extremely welcome to any who care about the planet. But its real significance does not lie in the targets for carbon dioxide reduction Obama has set. Those are way too modest. Its importance is that Obama is asserting the Federal government’s right to regulate CO2, which will come in handy when the American people get serious about fighting global warming. Unfortunately, Obama gave in to the fossil fuel industries and managed to set a relatively modest goal of a 7% reduction in annual carbon emissions by 2030, compared to 1990 levels. But that isn’t how he put it. He is saying a 30% decrease from 2006 levels. But 2006 levels were extremely high. Basically, in 1990 the US pledged to reduce emissions from 5 billion metric tons a year, but instead ramped up to 6 billion metric tons a year of carbon dioxide emissions by 2006. Then the 2008 economic crash hit, throwing ordinary Americans into a deep recession from which they have not emerged, even if the bankers who caused the crisis have. They lost their jobs and most still haven’t gotten them back. They moved into cities, unable to afford the suburbs or its commute. They stopped driving. They reduced petroleum use from 21 million barrels a day to 19.5 mn b/d and haven’t gone back to guzzling gasoline with the so-called recovery. 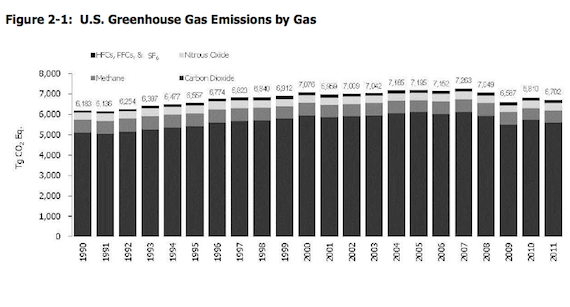 So obviously, US carbon emissions fell. At the same time, old coal plants are increasingly uneconomical and are being replaced by wind farms or fracked natural gas. Either way, emissions are reduced, though in the case of wind they go to virtually zero over time, whereas natural gas is about half as dirty as coal assuming fracking it doesn’t release massive amounts of methane into the air. Methane is a much more potent greenhouse gas, trapping the sun’s heat on earth rather than letting it radiate back into space. Some studies suggest that hydraulic fracturing of natural gas emits much more methane than had been estimated. So the real effect of the reduction in annual CO2 emissions by 1 bn. tons may not actually be very impressive once methane is accounted for. Between reduced economic activity, the rise of substantial wind energy in Iowa, Texas and elsewhere, and the fracking revolution, US C02 emissions fell back to 5.2 bn metric tons a year, near 1990 levels. That is, between 2005 and 2012 the EPA maintains that there was a 16 percent fall in US CO2 emissions. So Obama’s announcement today is do to another 14 percent reduction over 16 years. Apparently he wants to get down to 4.2 billion metric tons of C02 a year by 2030. A year. Every year. For the foreseeable future. Americans sometimes argue that it doesn’t do any good for us to cut our emissions because, India. But India, a country of 1.3 billion people that is rapidly industrializing only emits 2 billion metric tons of CO2 a year. Obama’s plan doesn’t take us anywhere near India’s virtue. I am not impressed with cutting a billion tons of CO2 annually. We still produce 5 billion metric tons of carbon dioxide a year! That’s 50 billion tons every decade! That will cook the earth. It needs to be zero and tout de suite– the goal year isn’t 2050, it is 2025. Imagine a serial killer who polishes off 5 people a year. He vows to cut back, but can’t help himself and starts killing 6 a year. He hurts his ankle, though, and can’t be as active, so then he makes do with just 5. And then he promises that in just 16 years he’ll cut back again, to only 4 murders a year. If you’re the police, or just a human being, you want him to cut back to zero murders a year. Now. In 16 years, at this rate he’ll have polished off 80 more people (in this metaphor, that means 80 metric tons of CO2). You aren’t impressed by the serial murderer’s self-control in cutting back slightly. I have stopped even trying to understand American government. I have no idea what drives a bright person like Barack Obama to offer half measures in a global crisis. He has all along tried to mollify the fossil fuel industries with “all of the above.” Is this a way of moving fast enough to satisfy the environmentalists in the Democratic Party and energize them to vote in Novemeber, but not fast enough to anger Big Carbon to the point where donations to Democratic candidates rather fall off? Anyway, it doesn’t matter. The world is likely going to a 9 or 10 degrees F. increase in temperature. It will be tropical everywhere and there will be no sea ice. Over a few thousand years, about a third of the world’s land mass will go under water. In this century we’ll lose the Egyptian Delta and much of Bangladesh. Although this change may be survivable, it is also possible that the climate will go chaotic because of that much heat. In that case the storm systems [i.e. hurricanes] could be so violent, long-lived and frequent as to make human life difficult. These are not just fallible computer projections of the old Club of Rome sort. The world has had this much CO2 in the atmosphere before, because of volcanic activity, and geologists have been studying the consequences. With the projections checked against real-world past developments, we can be pretty confidant of the conclusion. So, by all means. 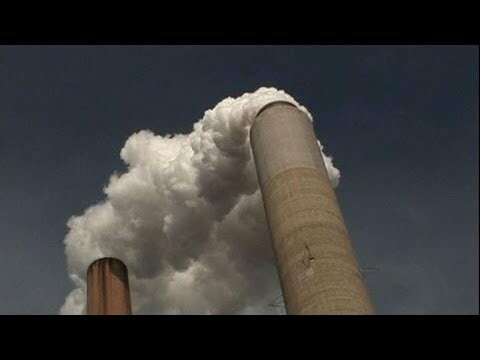 Close a few of the 600 US coal plants for CO2 pollution. Push people to stop burning coal. Retrain the coal miners to do something that doesn’t destroy the earth. But this level of activity is not really consequential for the problem. The one real hope for some amelioration is that solar energy falls in cost and rises in efficientcy so rapidly that everyone starts using them because it would be economically foolish not to. 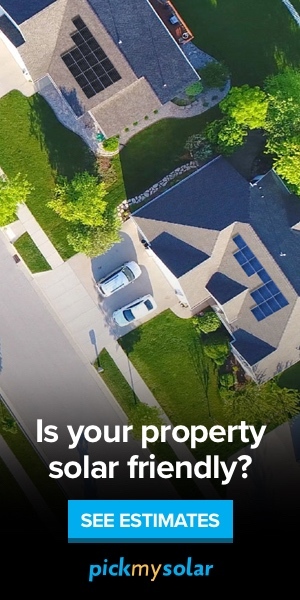 A solar revelotion is possible and probably depends more on the government and business making affordable financing available to home owners and businesses than on further technical innovations. That is, the EPA rules may not be Obama’s biggest contribution to green energy. It might be the money he spent on solar energy research and development.